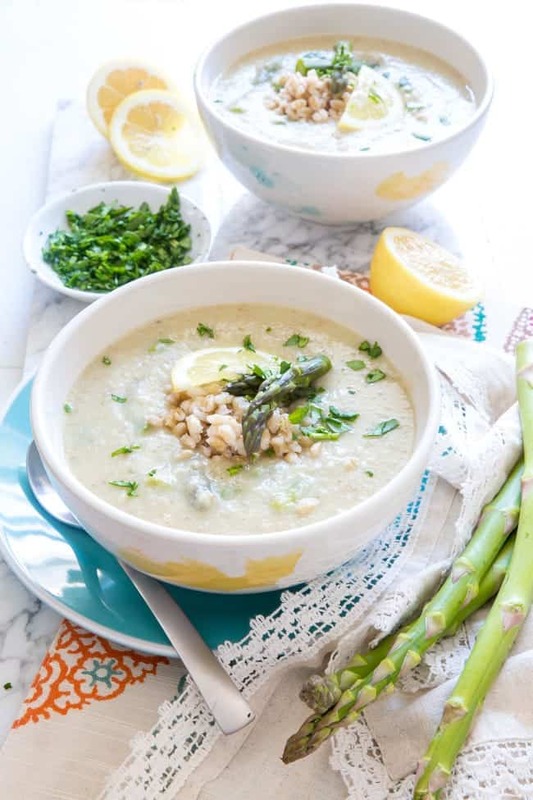 Spring flavors are combined in this light but flavorful soup. Hearty enough to fill you up for dinner but light enough for warmer weather. 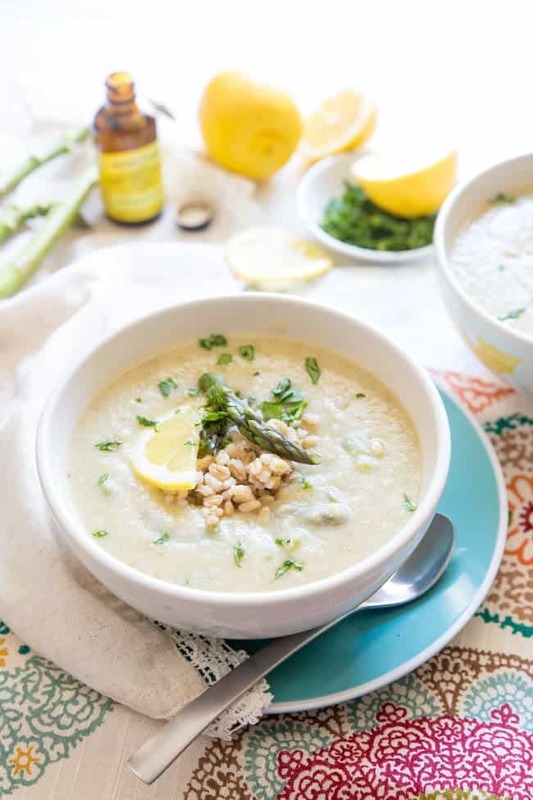 This creamy soup made without any dairy won’t leave you missing anything… except for seconds! I have to say, for once in my life I’m happy to be living in Utah. While the entire country seemed to get plummeted with snow and rain, we sat in almost-70 degree weather all last week! It’s been wonderful. Walks outside with the pupper and kiddo without a jacket! Windows open while I work! No need to de-frost the car in the morning! PLUS there’s the fact that I’m now in the mood to make light and airy dishes to quench my spring palette. Enter my new favorite soup recipe (and soon it’ll be yours too)! I’ve made lemon pasta. I’ve made lemon cake and bread. I’ve made lemon bars and cookies. Yup, that was the response I got from my family when I told them what was for dinner. 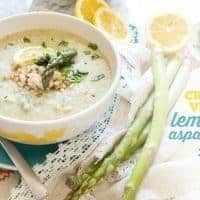 And although my family likes lemon-flavored recipes, they weren’t looking forward to it in the form of soup… or really anything that wasn’t cake. I knew it was weird. I knew I was taking a risk, but I just had a good feeling about this one. And boy I’m so glad I decided to trust that feeling because I am head-over-heels in love with this sunshiney bowl of lemon goodness. The lemon flavor is not a punch of sour like you’re eating a handful of sour patch kids. It’s mild. It’s light. And it pairs so nicely with seasonal asparagus, which I am also in love with. 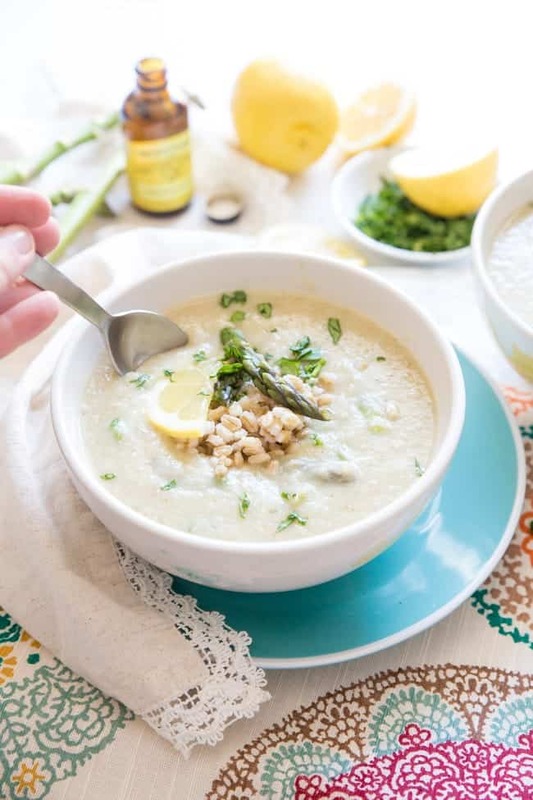 The reason for the mildness of the soup is because of the way I chose to add my lemon flavor. 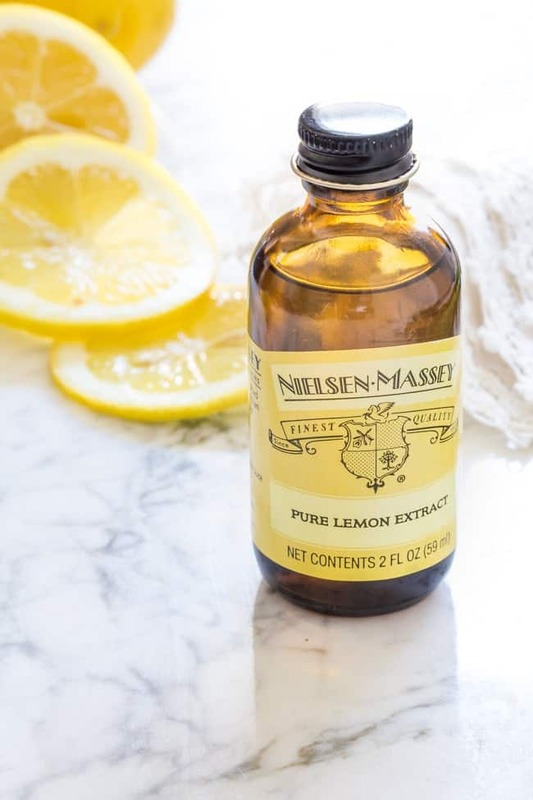 Instead of opting for super-acidic fresh lemon juice, I grabbed a bottle of Nielsen-Massey Lemon Extract. Such a smart choice when you’re making savory dishes this spring. It cuts out the acid and leaves you with a light and airy lemon flavor. 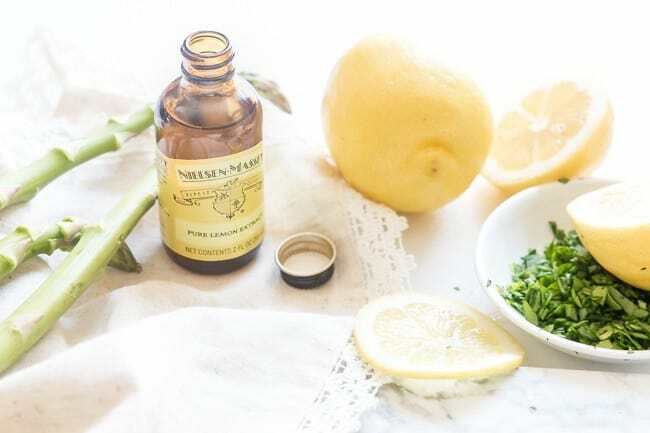 Lemon isn’t just for cakes anymore, and when you’re going the savory route, you definitely want to go with an extract. I’ve always been a fan of Nielsen-Massey’s high quality vanilla beans and especially the vanilla bean paste (which I’m featuring in a recipe soon! ), so I knew I wouldn’t be disappointed by giving another extract a try. Of course, to make a super creamy soup without the added cream, cauliflower came to the rescue once again. I just love the texture and creaminess it adds while still keeping up with my plant-based vegan situation. 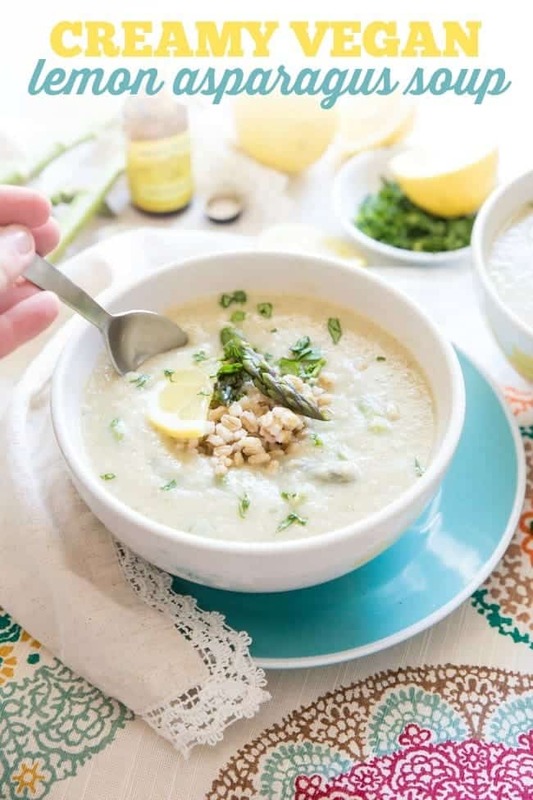 I promise you, you will not be missing out on the cream in this soup. It’s hearty enough to fill you up at dinner, yet light enough for the warmer months. So, what do you think? Can you go savory with lemon? 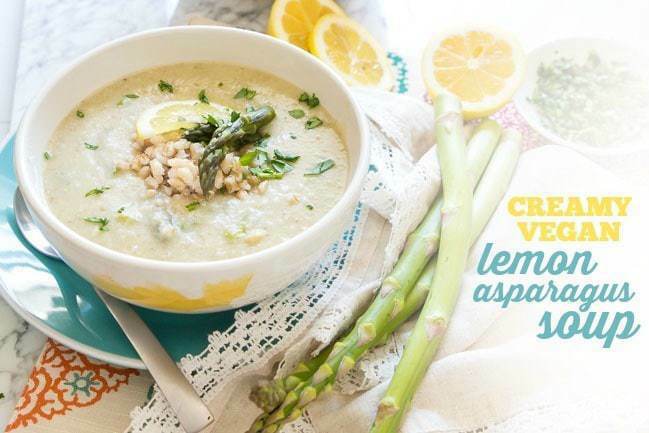 Spring flavors are combined in this light but flavorful soup. Hearty enough to fill you up for dinner but light enough for warmer weather. In a large stock pot, saute onion and garlic in olive oil over medium heat. Cook for 3-4 minutes until onion is translucent and garlic is aromatic. Add chopped cauliflower, 1 teaspoon lemon extract (see note 2), and herbes de provence and saute for a minute or two. Add in vegetable broth and bring to a boil. Simmer for 25-30 minutes or until cauliflower is fork tender. In the last 7-10 minutes of simmering add the chopped asparagus. 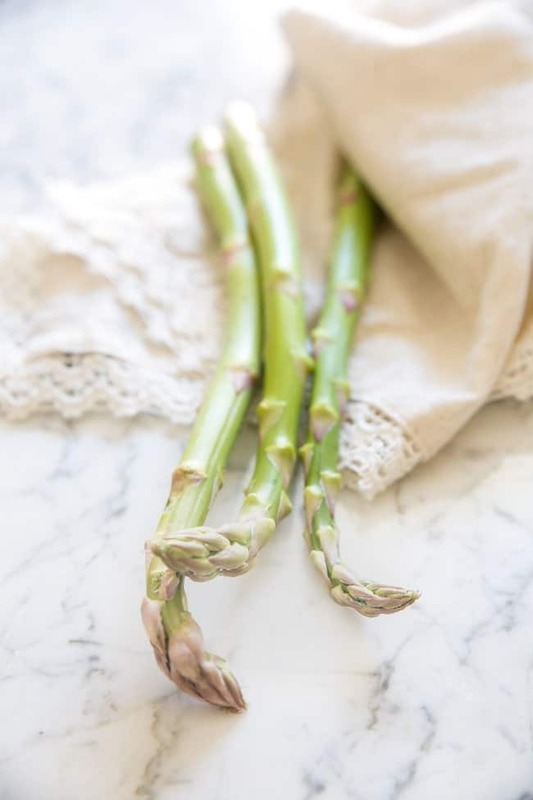 Use a steaming basket to drop into the soup and keep the asparagus separate. Once the asparagus is cooked through, pull it out and set it aside. Add barley (saving some for topping/garnish if you'd like), remaining 1 teaspoon of lemon extract, salt, and pepper to cauliflower broth. Using either an immersion blender or in batches with a high-speed blender, blend until creamy and smooth. Once it's as smooth as you'd like, stir in asparagus and serve. 1. You can make barley up to 3 days in advance for this recipe. It can also be cooked quickly in a pressure cooker. 2. 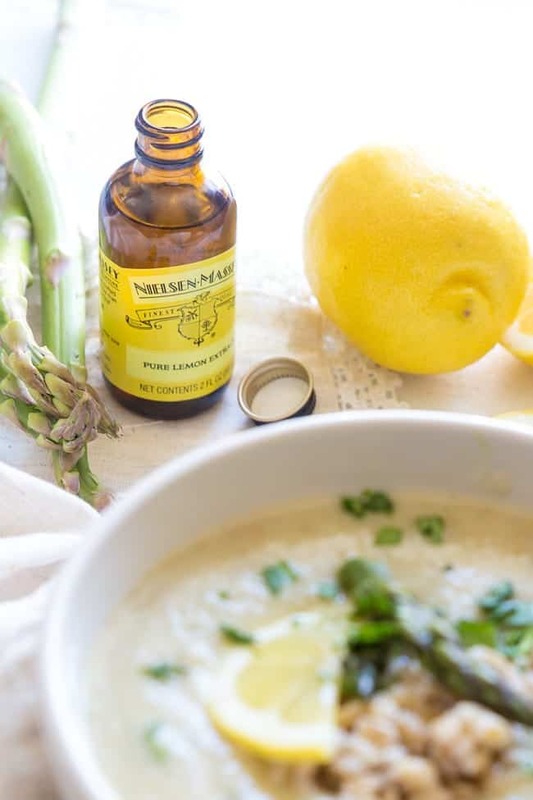 Instead of lemon extract, feel free to use 2 Tablespoons of lemon juice, adding one Tablespoon with the cauliflower and another when you blend everything together. THIS POST IS SPONSORED BY NIELSEN-MASSEY. THANK YOU FOR ALLOWING ME TO CONTINUE CREATING GREAT CONTENT FOR YOU BY SUPPORTING PARTNERSHIPS WITH SUPER AWESOME BRANDS THAT HFHL LOVES TO WORK WITH! AS ALWAYS, OPINIONS REMAIN 100% MY OWN. Just made this. Another wonderful tasty and simple recipe! I’m so glad you enjoyed it Vanessa. This is one of my absolute favorite creations by far.